Nitra is a city in western Slovakia, situated at the foot of Zobor Mountain in the valley of the river Nitra. Venture out of the city with trips to Trencin Castle (in Trencin), Spas & Wellness (in Piestany) and Town Tower (in Trnava). 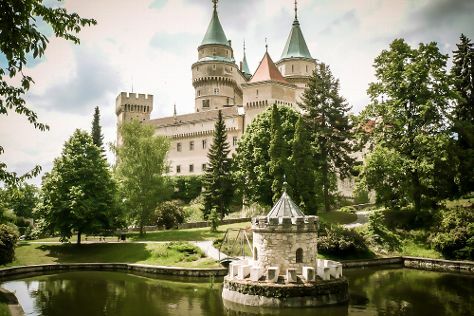 The adventure continues: step into the grandiose world of SNM - Bojnice Castle Museum, examine the collection at Diecezne Muzeum, cool off at Aquapark Senec, and meet the residents at Bojnice Zoo. To see more things to do, ratings, other places to visit, and tourist information, go to the Nitra holiday planner. September in Nitra sees daily highs of 24°C and lows of 13°C at night. Finish your sightseeing early on the 26th (Tue) so you can travel back home.